Friday night after strength training I made a huge pan of spaghetti with an arribiatta sauce with chickpeas and chicken breast. I was fuelling up for a fast 100km Saturday cycle and brick. Got up early had my porridge and was the first person to arrive at the meeting point in Richmond park. 16km into the ride we were cruising at 40km/hr my rear tyre blew out loudly and aggressively. Pulled over and fitted another tube and that blew out when pumping up- the tyre had split right open now so I used a gel pack on inside of tire and fitted another tube and turned back home. I was gutted. Got back and decided to brick the 36km cycle anyway with a 10km run. Run was great but I’ve been shattered all day from it and I’m aching which is strange for me. Maybe I’m coming down with something??? Right off to sleep now as got club running in the morning and swimming in the evening. Oh and I signed up for a 200km group ride to oxford and back next week. Should be good and get me used to the distance for ironman. Happy day peoples except now I need 2 new tyres – but hey I covered over 2000km on the last set!! This entry was posted on March 2, 2014, 1:14 am and is filed under Daily Blog. You can follow any responses to this entry through RSS 2.0. You can leave a response, or trackback from your own site. Wow! 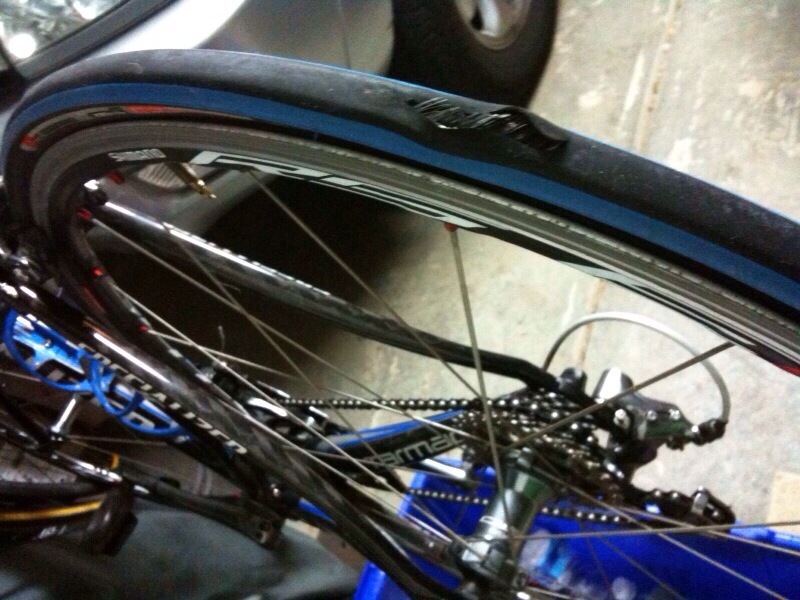 I’ve seen (and heard) lots of spectacular tube blow outs, but you don’t often see a tyre go like that. That’s just bad luck! Which IM are you training for? IM UK in Bolton on the 20th July – I have put on a pair of Michelin pro4 endurance now – the roads after this winter are atrocious.